What’s the gift you wanted more than any other as a kid? The one that could do everything and would change everything. The last gift you’d ever want. If you could just get this one thing, you’d never ask for anything else again. These weren’t rational thoughts, of course, though you definitely believed them then. That’s what made them fun. Fandom offers some of the same appeal. It’s a license to hold on to hope above anything else. 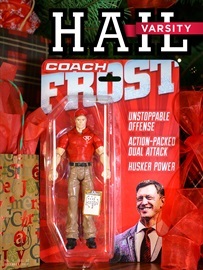 The December cover of Hail Varsity. After some dry years, the floodgates of hope have reopened in Husker Nation. That’s a feeling we tried to capture on the cover of our December issue. A collaboration between Founder/CEO Aaron Babcock (photography), Design Director Quentin Lueninghoener (package design) and local illustrator Tim Mayer (action figure design), the cover commemorates Scott Frost’s return home, and, well, we think you’ll get the feeling. >>Staff writer Derek Peterson went to Wood River to talk to the people who knew Frost before he was Husker great, much less the hottest coaching candidate in the country. The story also features some fantastic photography from James Wooldridge. >>Cody Nagel, currently a senior at Nebraska, writes personally on the 23 Husker football losses he and his classmates experienced, one of the toughest four-year stretches in Lincoln. The student section is often a topic of discussion, but it’s a story that rarely gets told by one of its members. >>Staff writer Jacob Padilla shares a Q&A with freshman guard Thomas Allen. >>Editor Mike Babcock pens an excellent column on seeing former Huskers, some separated by 50 years or more, turn out to welcome Frost back to Lincoln. >>Of course we didn’t forget about volleyball. We’ve got spectacular photos of the Huskers’ Big Ten title-clinching victory and run through the first two rounds of the NCAA Tournament from Aaron Babcock, and managing editor Brandon Vogel writes on the unique leadership of Kelly Hunter in the letter from the editor. After a rough fall on the football field, it has turned into a great winter for Nebraska. Make sure you don’t miss any of it by subscribing today. 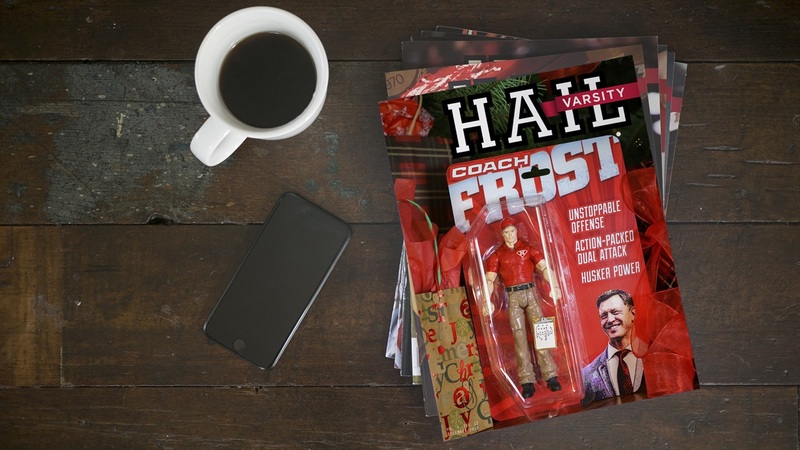 The latest issue of Hail Varsity arrives on newsstands and in mailboxes this week.